For a base brand, Topps' MLS line has a lot of autographs and memorabilia. This doesn't change with 2015 Topps MLS Major League Soccer, which has an autographed relic, a pair of autographs and two additional relics to go alongside a decent-sized main set and several inserts. The 2015 Topps MLS base set has 200 cards that highlight veterans and young players from all 21 of the growing league's teams. Subsets spotlight venues as well as 24 of the top players under the age of 24. Numbered parallels include Purple, Gold (#/25), Black (#/10), hobby-exclusive Printing Plates and Red (1/1). Select cards also have All-Star Short Prints, photo variations from the 2014 All-Star Game. Base Autographs take on the same design as the main set, only with a stickered signature. These have three levels of parallels numbered to 25 or less. Retired stars are the focus of Admired Alumni Autographs, a new set that will carry over into other brands and releases. MLS Personalities reach beyond the pitch to include people and celebrities involved with the league. The one-per-box Autograph Relics use stickers as well to compliment the swatch of game-used jersey. Parallels include Gold (#/25), Black (#/10), Printing Plates and Red (1/1). Kits of the Game deliver the basic relic cards in 2015 Topps MLS. Featuring swatches of match-used jerseys, numbered parallels fall in line with the Autograph Relics. 2015 Topps MLS also has a few basic inserts. Presence of the Pitch (1:6 hobby packs) have a design that resembles what you might expect from a poster. Photos for this set center on player emotion. 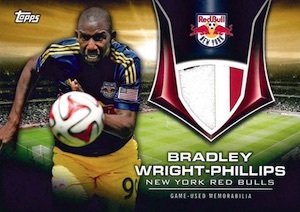 Presence of the Pitch also has numbered autographed versions as well. Gameday Heritage looks at events in and around matches. MLS Minis use reproduction sketch images and are based on vintage designs. 10 cards. View a complete gallery with side-by-side comparison. Good: Five hits per box, SuperDraft rookies return, better overall designs, David Villa autographs. Bad: Thin stock, no jumbo relics, sticker autographs. The Bottom Line: While the overall look of the product takes a step forward and the inclusion of the SuperDraft rookies addresses a main complaint from last year, 2015 Topps MLS drops a relic hit per box compared to the last two years and struggles to justify the hobby box cost given the checklist of sticker autographs and small relic cards. 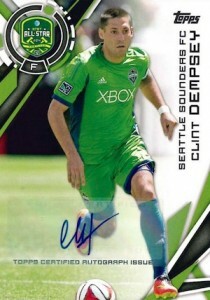 Compared to the paint smear design of 2014 Topps MLS, the 2015 base design is largely simple and hard to complain about. However, the white-lined text choice and orientation is not ideal and I personally don't care for it mainly because it harder to read. 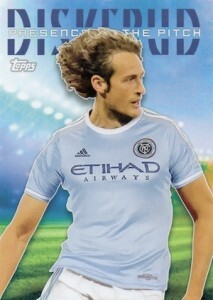 Purists may not care for the RC designation found on the cards for Kaka and Mix Diskerud, among others. Also, it is worth noting the full checklist is basically split into three groups. Normal base feature the club crest, while all the All-Star players feature a 2014 All-Star logo and the 24 Under 24 only include the Adidas 24 Under 24 logo. The players in each group are only available in that specific card format. I think it would have been better to just stick with the team logo on each card as that is what fans care about most. Parallels are somewhat disappointing as they are very easy to miss and seemingly add very little to the product. The All-Star base variations feature a consistent theme and are easy to spot. To me, this is a good thing. Also, they are not incredibly tough to pull, and drop around 1:2 boxes. This could make for a enjoyable chase for those that are inclined. The inserts offer some variety, but come across as mostly uninspired. The MLS Mini are some of the most common and are little more than a colored pencil sketch of a particular soccer play. I feel like these add nothing. 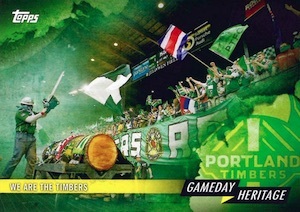 While it is hardly a new concept, the Gameday Heritage do offer some impressive images of the various fan bases. Also, the Presence of the Pitch inserts have a fresh look and are probably the best design in the product. But the large text at the top feels a little cluttered. The base autograph hits are simply base parallels with a sticker autograph so they are not that impressive in-hand. It is nice that the base relics are numbered and noted as game-used. The checklist is okay and most of the bigger names are found. David Villa is a big signer and is joined by Dempsey, Bradley, Besler and many others. Overall, the autograph checklist is quite large and while fans of the MLS may recognize most of the names, the values are minimal for the majority of the checklist. Also, the high profile additions to the MLS are not included and this hurts the product. Kaka and Sebastian Giovinco are both names that collectors would have liked to have seen in the 2015 Topps MLS autograph checklist. It is odd that players that changed teams months before the season started or even left the MLS entirely are still included with outdated information. 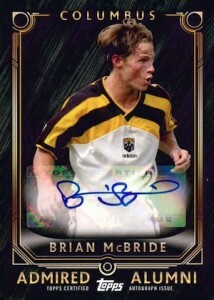 Also, two of the five autograph sets (Admired Alumni & MLS Personalities) only have five total cards combined. I am not sure if a bunch of subjects did not return cards or what, but it certainly comes across poorly. Without any big pull potential, value is very tough to find in 2015 Topps MLS at the current prices. While David Villa is a nice possibility, even his signed cards are not enough to cover the box. The removal of the sixth hit and the jumbo relics also hurts the overall value as these were some of the most popular cards from last year. At around $100 per box, there are certain expectations and the format makes it hard to ever meet that. If you enjoy the MLS, the pure collecting aspect can make it more fun. So, for me, this is a fun break with some flaws. Hits are fun and so are short prints, especially when you immediately know that you hit one. Unfortunately for collectors, values and interest for the MLS pales in comparison to the bigger European leagues. While this is not new information, it would be nice if the pricing was more in line with the actual value of the product. 2015 TOPPS CLINT DEMPSEY GU #76 85 & MIKE MAGEE CERTIFIED AUTO LOT MLS SOCCER ! Any update on what players will have auto’s?? Topps apparently have said David Villa will have auto’s in the product. Wondering who else? Wow bought three boxes and received more that I expected. Chris Wondolowski 1/1 Patch Printing Plate, Michael Bradley Autographed #d/10, Higuain Auto Patch #d/10, 1/1 Printing Plate and a Red 1/1 Arnaud. Plenty of other stuff but very nice product. Highly recommend. 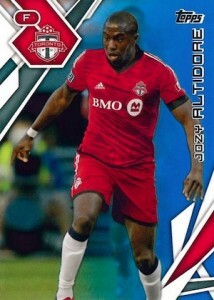 What I liked about the UpperDeck MLS card sets were the rookie cards of the SuperDraft picks. Topps has no such thing. Big disappointment for me. Actually there are a lot of the super draft rookies in the set. If you would just read it. Always looking to buy or trade for Rsl cards. Always love the new annual soccer release, though it took a couple weeks for Target to put out the blaster boxes here for whatever reason. My wife finally found them today and we opened four blasters. Picked up 5 blue parallels, one black, the standard four autographs (one per box), but two of them were parallels, Pedro Morales blue, 46/50; and Darren Mattocks gold, 14/25. Higuain was one of the two regular autographs, which was cool, but dude didn’t put much effort into his auto. :) Other hit was a Will Johnson Kits of the Game Relic, 13/15. Total of 11 hits in some form (numbered, autos, relics) from the four boxes. Not bad. The # of doubles was a bit much. But ended up at 123 set cards I think out of 200. Not big on the standard inserts, but the MLS Minis are a nice addition. Will definitely buy more as I want to get the set complete at the very least. Ed- you were LUCKY to find the blaster boxes at Target. I heard that only the top 100 selling soccer products at Target stores got blaster boxes nationwide-and that they are completely SOLD out! I still haven’t seen Autographed Relics of Beckerman and Bunbury…. Has anyone come across them? Waited patiently and very disappointed with the quality of the card stock. The 2014 cards were better quality. The specialty cards (All-Star and Draft-Picks) are very boring and predictable. The extras? Really, Topps? That’s what you’ve got? I hope MLS finds Panini’s address soon.